The AmaDS3 waste water pump station with integrated solids separation system combines reliable service with excellent efficiency. 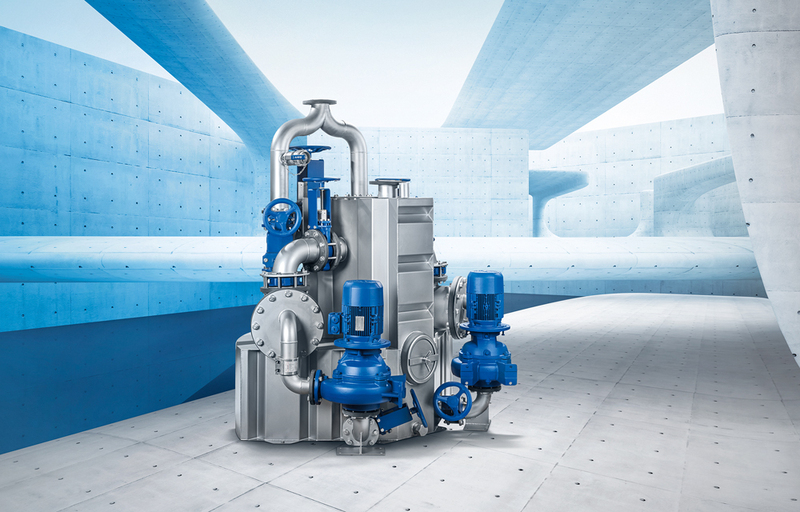 Clogging is practically prevented by upstream separators which protect the pumps from coarse solids. Drainage of hotels, hospitals, campgrounds, etc. Thanks to the patented solids separation system, the solids are separated from the waste water and temporarily stored in the solids separators. Only pre-treated waste water not containing coarse solids flows through the pumps. The pre-treated waste water is pumped through the solids separators in the opposite direction and carries the solids out of the separators and into the discharge line. Through this process the solids separators and pumps are cleaned and ready for the next inflow phase. Pumps with smaller free passages than usually required have higher efficiencies and help save energy compared with conventional waste water pump stations. The pumps are protected from coarse solids by the solids separation system, resulting in reduced wear and increased plant availability. The dry-installed system is closed and gas-tight, thus offering hygienic working conditions and a high level of reliability and safety. As pumps with smaller free passages are employed, high heads can be achieved with a single pump station. This means the AmaDS³ waste water station is well suited for use in pumped drainage systems covering long distances. Many hydraulic systems and impellers, which would not normally be suitable for handling raw sewage, can be installed in AmaDS³ stations for the transport of raw sewage. Redundancy of all important components ensures that the system can be serviced and maintained while it is in operation. Located externally, the solids separators are easy to access and thus simplify maintenance work considerably.